This study presents a unique array of velocity profiles from Electromagnetic Autonomous Profiling Explorer (EM-APEX) profiling floats in the Antarctic Circumpolar Current (ACC) north of Kerguelen. The authors use these profiles to examine the nature of Ekman spirals, formed by the action of thewind on the ocean’s surface, in light of Ekman’s classical linear theory and more recent enhancements. Vertical decay scales of the Ekman spirals were estimated independently from current amplitude and rotation. Assuming a vertically uniform geostrophic current, decay scales from the Ekman current heading were twice as large as those from the current speed decay, indicating a compressed spiral, consistent with prior observations and violating the classical theory. However, if geostrophic shear is accurately removed, the observed Ekman spiral is as predicted by classical theory and decay scales estimated from amplitude decay and rotation converge toward a common value. No statistically robust relationship is found between stratification and Ekman decay scales. The results indicate that compressed spirals observed in the Southern Ocean arise from aliasing of depth-varying geostrophic currents into the Ekman spiral, as opposed to surface trapping of Ekman currents associated with stratification, and extends the geographical area of similar results from Drake Passage (Polton et al. 2013). 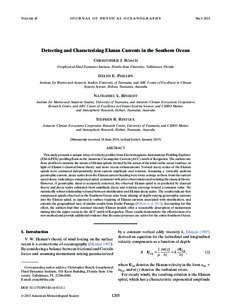 Accounting for this effect, the authors find that constant viscosity Ekman models offer a reasonable description of momentum mixing into the upper ocean in the ACC north of Kerguelen. These results demonstrate the effectiveness of a new method and provide additional evidence that the same processes are active for the entire Southern Ocean.